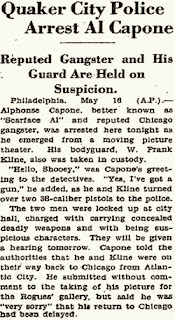 May 16, 1929 - Chicago crime lord Al Capone and his lieutenant, Frank Rio, were stopped by police detectives outside the Stanley Theatre, southwest corner of Nineteenth and Market Streets in Philadelphia, Pennsylvania. The notorious gangsters insisted they were in Philadelphia to kill only time, while waiting for the next Chicago-bound train. Detectives found that both men had handguns. Capone and Rio were arrested for carrying concealed deadly weapons. Capone gave a detailed statement to authorities describing his situation: He and Rio were returning from a Chicago underworld peace conference at Atlantic City, New Jersey. They were driving to the North Philadelphia Station to catch the afternoon Broad Way Limited train back to Chicago. Automobile problems caused them to miss their train. The next train was scheduled to leave North Philadelphia some hours later, and the two gangsters decided to relax in the theater. 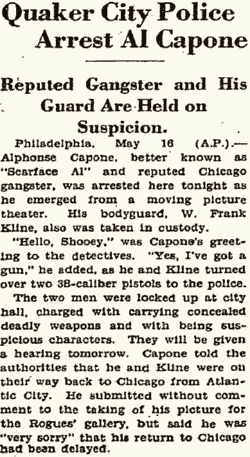 Capone's surprising stay in Pennsylvania began with a night in police lockup and would stretch on to a year. Treating the charge dismissively, the next day the Chicago boss and his aide pleaded guilty to weapons possession. They appeared stunned when Judge John E. Walsh sentenced them to one-year sentences in state prison. The U.S. press immediately began speculating that Capone orchestrated his arrest and conviction in order to escape the vengeance of underworld rivals. Chicago's St. Valentine's Day Massacre occurred only three months earlier. 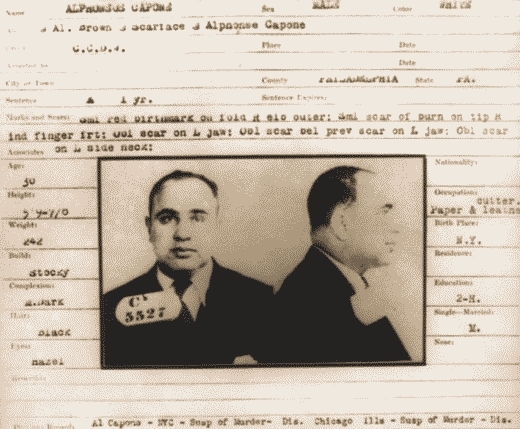 Some claimed that former Chicago underworld leader Johnny Torrio had come out of retirement to order Capone to have himself arrested so things in the Windy City could cool down. No known data or reasonable analysis of available data supports these notions. Capone certainly was not a willing prisoner. His attorney tried to postpone the trial, to achieve Capone's discharge on a bond that he would never reenter the city and to arrange a suspended sentence. Capone subsequently griped over the speed of his trial and the severity of his punishment, and he actively sought his release on appeal. Other legends sprang up relating to the meeting in Atlantic City. Some books and television programs have suggested that it was an organizational meeting - called by Salvatore "Charlie Luciano" Lucania, Johnny Torrio or Frank Costello - for a nationwide criminal syndicate. Others claim it was a sort of intervention by the nation's gang bosses to break Capone of his murderous habits or a disciplinary hearing against the Chicago gang leader. When Herbert Asbury, who had a strong tendency toward sensationalism, published The Gangs of Chicago in 1940, he basically repeated the Capone account, calling the Atlantic City event a peace conference of Chicago bosses. Asbury's sensationalist tendency was satisfied merely by inflating the number of Chicago bosses to thirty. In the same year (1940), Thompson and Raymond's Gang Rule in New York seems to have been the first book to claim that the meeting involved bosses from outside of Chicago. They placed the convention at the Hotel President and said attendees included "most of the leaders in the national Unione Siciliane." The purpose, according to the authors, was to put a stop to Sicilian and Italian gangland feuds and arrange a system for a panel of bosses to consider and approve of killings before they were performed. The authors claimed that Frank Costello developed those ideas. Twenty-two years later, Bill Brennan further expanded the conference story and added details for his book, The Frank Costello Story. Brennan, apparently realizing that Costello was not a boss in 1929 and did not have the authority to call a nationwide conference of underworld leaders, portrayed the Hotel President gathering as a bit of an insurrection against old-line Mafia bosses like Giuseppe "Joe the Boss" Masseria. Providing no source, Brennan claimed that the attendees included Capone, Jake Guzik, Frankie Yale, Joe Adonis, Frank Erickson, Owen Madden, Max Hoff, George Remus, Solly Weissman, Larry Fay and members of Detroit's Purple Gang. There were problems with Brennan's account - not the least of which was the death of Frankie Yale almost a year earlier - but that did not stop other authors from picking up the ball and running with it. The Chicago Crime Book of 1967, edited by Albert Halper, tried to return the story to its origins with added importance for former Chicago gang boss Torrio. A chapter written by Francis X. Bush said that the Atlantic City conference involved Capone, Torrio, Joe Aiello and Bugs Moran, along with their chief aides. The conference concluded, he said, with a formal written agreement establishing a crime syndicate in Chicago. Torrio was set up as its supreme arbiter. For some reason, Bush placed the meeting in June 1929, when Capone already was behind bars in Holmesburg County Jail (he was transferred to Eastern State Prison in August). When Jack McPhaul took a shot at the Torrio life story in 1970's Johnny Torrio: First of the Gang Lords, he combined various elements from previous writers for his account of the convention. There was the Torrio supremacy of the Halper book, the imposed preservation of gangland peace of the Thompson and Raymond volume and the expansive guest list of Brennan. According to McPhaul, Torrio ordered Capone to attend the convention, which McPhaul viewed as a disciplinary hearing, and then ordered Capone to get himself arrested and imprisoned (apparently it did not matter to Torrio where Capone did this). John Kobler, who handled many other phases of Capone's existence more responsibly in his 1971 book Capone: The Life and World of Al Capone, seems to have found the Atlantic City convention legends irresistible. According to Kobler, the convention lasted three days and featured numerous gang bosses from around the country, all agreeing to combine into a national syndicate run by an executive committee. "Cutting across all the old ethnic and national divisions," Kobler wrote, "there gathered around the table not only Italians and Sicilians, but also Jews, Irish and Slavs, more than thirty gangsters in all." (Big table!) The list of attendees was expanded from previous accounts to include Dutch Schultz, Nucky Johnson, Joe Saltis, Frank McErlane, Sam Lazar and Charles Schwartz. Fred Cook largely echoed this account for his (emotionally titled) 1973 book, Mafia! But Cook, perhaps benefiting from access to the meeting minutes, said the Atlantic City convention resulted in four major decisions: 1. U.S. was carved into crime districts; 2. No boss could be killed without approval of a leadership commission; 3. Syndicate would gather a bribery fund for police and politicians; 4. A fund would be set up "to groom young gangsters for the Syndicate." The resistance of old Mafia bosses to this new syndicate, Cook wrote, made the Night of Sicilian Vespers (another grossly inflated legend) necessary. The next year, Frank Costello: Prime Minister of the Underworld by George Wolf with Joseph DiMona stated that the Atlantic City meeting was called by Frank Costello and Johnny Torrio. The book claimed that Costello was then - in 1929 - at the height of his power (allowing him a gradual decline spread out over the next four and a half decades). The conference guest list was dramatically altered so that Chicago's Frank Nitti could be there, along with Lou Rothkopf, Moe Dalitz, Charles "King" Solomon, John Lazia, Joe Bernstein and Louis "Lepke" Buchalter. Wolf's book provided a detailed but sourceless look at the convention, referring at one point to the "crystal chandelier" that "dangled above the rich mahogany table and chairs, which gleamed from recent polishing." (Wolf neglected for some reason to explain that mahogany is an excellent wood choice for furniture at a seaside hotel, as its density makes it extremely resistant to rot.) Wolf said the convention set up a national crime syndicate overseen by a commission of leaders and arranged for Capone to temporarily serve time in prison so things could be smoothed out with his Chicago rivals. 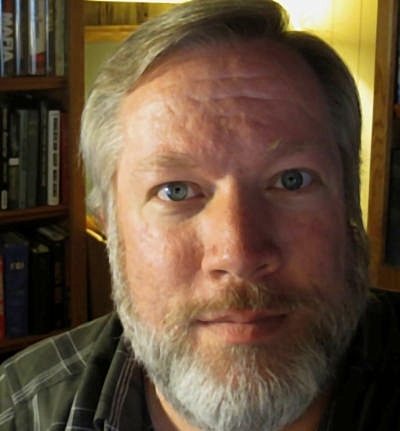 Virgil W. Peterson further increased the 1929 Atlantic City guest list for his 1983 book, The Mob. He had Albert Anastasia, Vincent Mangano, Frank Scalise, Longie Zwillman, Willie Moretti and Meyer Lansky (honeymooning with his new bride) also meeting at the Hotel President. Peterson reported a widespread belief that Capone arranged for his own Philadelphia arrest after the convention, but he left it for the reader to decide between unlikely choices: 1. Capone was ordered to prison by other gang bosses in attendance at the Atlantic City convention; 2. 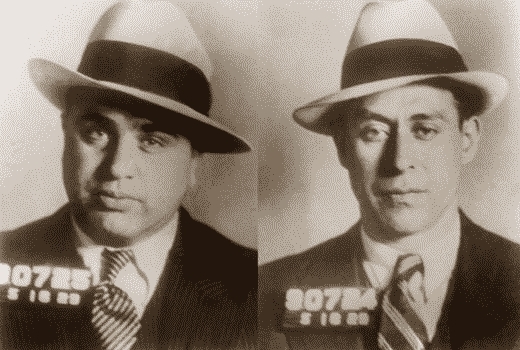 Capone arranged after the convention to go to prison seeking protection from enemies. Apparently unworthy of consideration was the possibility that Capone was an out-of-area gangster caught carrying a concealed weapon and a local judge threw the book at him. Despite decades of invention and exaggeration, the truth of the May 1929 conference in Atlantic City probably is quite close to the earliest accounts. 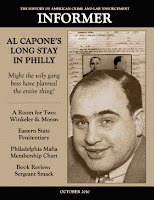 "Al Capone's long stay in Philly"
in this back issue of Informer.